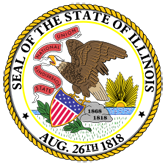 Description: The Illinois MAIN STREET Program, through the Illinois Historic Preservation Agency, has provided this free design assistance to qualified property/ business owners in the officially designated MAIN STREET project areas. 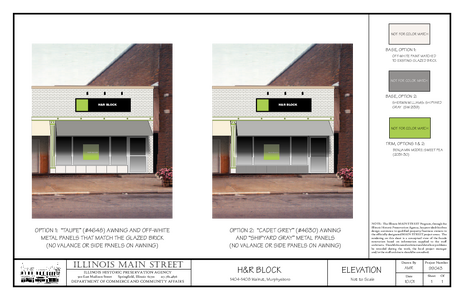 The rendering on this sheet is a conceptual view of the facade renovation based on information supplied to the staff architect. Description: NO. 5-07-0387 In The Appellate Court Of Illinois Fifth District Angelia Hacker, Plaintiff-Appellee, v. Shelter Insurance Company, Defendant-Appellant. Appeal from the Circuit Court of Jackson County. No. 05-MR-64 Honorable E. Dan Kimmel, Judge, presiding. Description: Sixth Division, April 18, 2008 No. 1-07-1971 LEONARD JAMES HACKL, as Independent Executor of the Estate of Cynthia Snow Hackl, deceased, Plaintiff-Appellee, v. ADVOCATE HEALTH AND HOSPITALS CORPORATION, an Illinois corporation, d/b/a Advocate Good Shepherd Hospital, Defendant-Appellant. Appeal from the Circuit Court of Cook County. No. 06 L 8894 Honorable Diane J. Larsen, Judge Presiding. Description: NO. 4-07-0506 Filed 2/26/08In the Appellate Court Of Illinois Fourth District, WILLIE B. HADLEY, JR., Plaintiff-Appellant, v. JORGE MONTES, Chairman of the Illinois Prisoner Review Board, and All Members, Defendants-Appellees. Appeal from Circuit Court of Sangamon County No. 07MR60 Honorable Leslie J. Graves, Judge Presiding. Description: This appeal is concerned with discovery in a defamation case. At the time the statement at issue was posted on the internet, the Sandusky sexual abuse scandal had dominated the national news for weeks. Description: NO. 5-05-0354 IN THE APPELLATE COURT OF ILLINOIS FIFTH DISTRICT JESSICA HALL, Individually and on Behalf of Others Similarly Situated, Plaintiff-Appellee, v. SPRINT SPECTRUM L.P., d/b/a Sprint PCS Group, and SPRINTCOM, INC., d/b/a Sprint PCS Group, Defendants-Appellants. Appeal from the Circuit Court of Madison County. No. 04-L-113 Honorable Nicholas G. Byron, Judge, presiding. Hall v. Sprint Spectrum L.P. 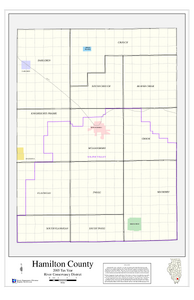 Description: Hall v. Sprint Spectrum L.P. NO. 5-05-0314 IN THE APPELLATE COURT OF ILLINOIS FIFTH DISTRICT JESSICA HALL, Individually and on Behalf of Others Similarly Situated, Plaintiffs-Appellees, v. SPRINT SPECTRUM L.P., d/b/a SPRINT PCS GROUP, and SPRINTCOM, INC., d/b/a SPRINT PCS GROUP, Defendants-Appellants. Appeal from the Circuit Court of Madison County. No. 04-L-113 Honorable Nicholas G. Byron, Judge, presiding. 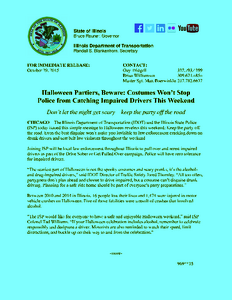 Description: Press Release: The Illinois Department of Transportation (IDOT) and the Illinois State Police (ISP) today issued this simple message to Halloween revelers this weekend: Keep the party off the road. Even the best disguise wont make you invisible to law enforcement cracking down on drunk drivers and seat belt law violators throughout the weekend. Description: Appellate citation: 382 Ill. App. 3d 169. JUSTICE KARMEIER delivered the judgment of the court, with opinion. Chief Justice Fitzgerald and Justices Freeman, Thomas, Kilbride, Garman, and Burke concurred in the judgment and opinion. Description: Appellate citation: 382 Ill. App. 3d 169. JUSTICE KARMEIER delivered the judgment of the court, with opinion. Chief Justice Fitzgerald and Justices Freeman, Thomas, Kilbride, Garman, and Burke concurred in the judgment and opinion. This dispute over drainage tile in farmland comes from Grundy County. 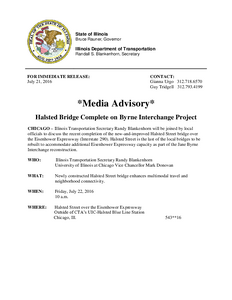 Description: Press Release: Illinois Transportation Secretary Randy Blankenhorn will be joined by local officials to discuss the recent completion of the new-and-improved Halsted Street bridge over the Eisenhower Expressway (Interstate 290). 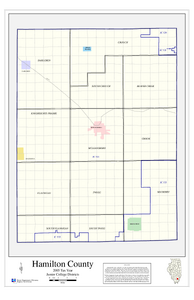 Description: Illinois Taxing District Map for Tax Year 2005. 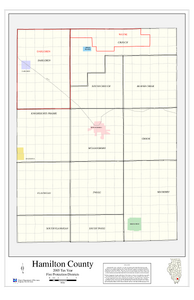 Geospatial data representing taxing district boundary information collected from Illinois county clerks. 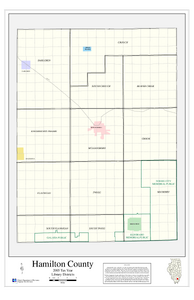 Map identifies the boundaries of property tax districts to be used for general illustration and research.